Description: Roadrailer engine backing out of Saginaw Yard to reposition at Lake Wanda, and subsequent return to Saginaw Yard, for the nightly run to OKC. Title: NS 213 @ 1202 hrs. Description: Ex-Conrail #6074 heads WB passing old tank car recently acquired by the Phillipsburg Railroad Historians. Title: H76 Notching It Up @ 1204 hrs. Description: Allentown, Pa to Manville, NJ local smoking it up pass the PRRH site. 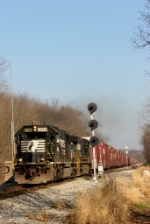 Description: 119 leans into the curve at China Grove with an SD60 leading. Description: Not really Collinsville, we'll call it Bent Stump, Ala. Description: Lotta power thru N. Ala. Description: This photo was taken from behind the Strack & Van Til's store in Hessville. Description: The 88's have it! Westbound NS gen freight 17G through CP Ford at the NTC station. Description: Another day, another 12T, this time with a pair of SD60s and a D8. Description: Eastbound departing the yard as he crosses over on to track two.